I was at Costco on Tuesday, mainly to pick up some laundry detergent, but as usual, I was sucked in to buying other things I didn’t need. The product even has a cute little jingle. Turn up your speakers and give it a listen when this web site opens. Anyway, I first saw this about 2 weeks ago at a trip to Super Target. It was $4.59 for one can. I thought to myself, “That’s the cost of 4 batches of homemade pancakes in my house!”, and left it alone. But at Costco on Tuesday, there was a THREE PACK for $2.97. Really? Well golly! How could I refuse that? So I picked up a three pack. This morning I made them for Timmy and me for breakfast. I’ll bypass the suspense and say that these pancakes weren’t bad, but they clearly weren’t homemade. According to the directions, it’s just point and shoot onto a skillet or frying pan. They recommend a 400F degree surface, but I don’t. I played it safe and kept my electric skillet at 375F. The initial presentation is quite shocking…although the can looks like Reddi Whip, I didn’t expect the batter to come out looking just like Reddi Whip! After about 10 seconds, the batter will spread out, so be sure to account for this. So on my 375F skillet surface, it didn’t take long for these pancakes to over brown. I didn’t get the tell tale bubbles, and it was tough to tell if the edges were cooking well…so upon first flip, this is what I was greeted with. 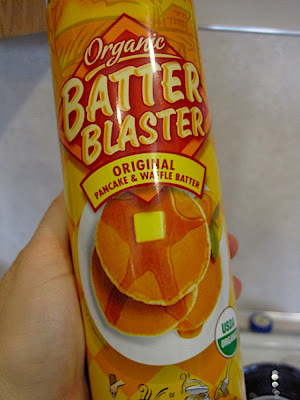 The flavor isn’t bad, it’s slightly sweet, which is how we prefer our pancakes here, but there’s a tell tale ever-so-slight chemical flavor that sends alarm bells through my head that this is NOT homemade. As for texture, these are flatter pancakes than I’m used to making, and they seemed to get leathery in a hurry if we didn’t eat them right away. I couldn’t cut them with a butter knife, and had to break out my kitchen shears to cut up Timmy’s. But Timmy didn’t mind — he had 4 of them for breakfast! One more thing, this product is also supposed to work on a waffle iron. I’ll have to try it later this week. 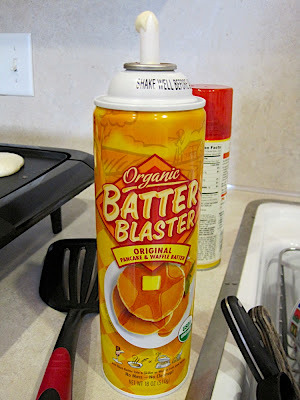 In conclusion, I will use the cans I have for the next several batches of pancakes and/or waffles (each can makes 28 4″ pancakes, so I’m guessing 18-20 6″ pancakes which is our preferred size). But that’s probably it. I have to admit it’s quicker and more convenient than beating the eggs and measuring out the flour and baking powder.